There aren’t too many things that upset me. One item that does is people who put personal data on their USB drives without password protection. They are just waiting for a disaster as sooner or later that thumb drive will vanish. The question is who will get the data next? If you don’t want to spend money for a secure flash drive, then we’ve got a free encryption utility you should use called Cryptainer LE. As a bonus, it even works on your desktop or notebook. Too often we focus on the convenience of USB drives and not the importance of the data. We treat them like the old floppy disks. No passwords and no encryption. Unlike the old floppies, people are able to put large quantities of personal data on these removable drives. I’ve seen unprotected items ranging from QuickBooks files to online passwords with lots in between. There are different ways that you can protect your data. Previously, we wrote about biometric USB drives which offer a high degree of security for a high price. This time around, we thought we would find a free utility that could password protect and encrypt our USB drive. We found one called Cryptainer LE from Cypherix. 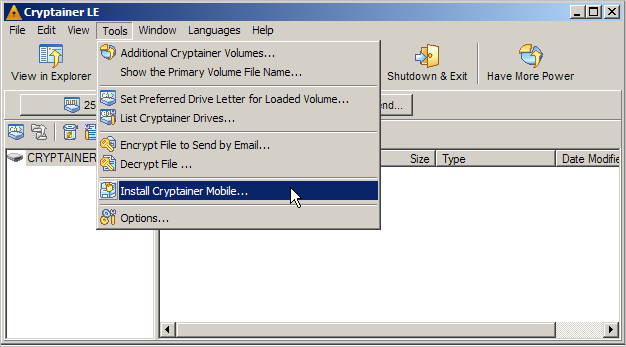 The other item that distinguishes Cryptainer LE is that it has a component that can be loaded on to USB drives called Cryptainer Mobile. This means you can carry your data on the thumb drive without needing a program on the host computer to decrypt. The one caveat is this doesn’t work with Windows 98 and Windows ME since those operating systems don’t auto load USB drivers. The program works by creating a volume where you drag and drop the files and folders you wish to protect. Each volume has its own password. You might think of the volume as a vault of a set size you decide. The volumes have a .cry file extension and can be as large as 25mbs in the free version. You can create as many volumes as needed. 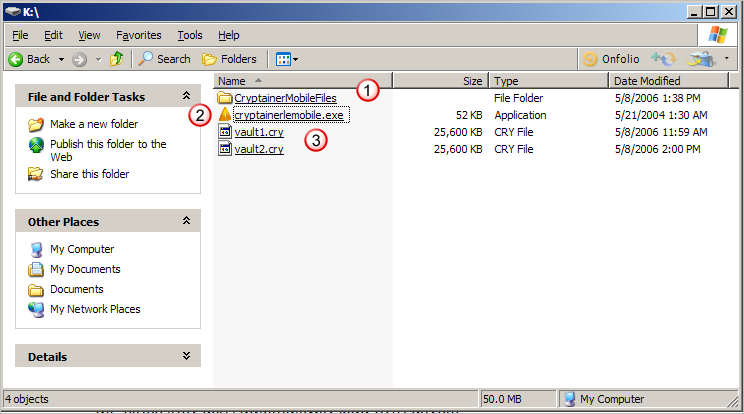 CrpytainerMobileFiles folder this folder has the program files. The contents are not encrypted. If you delete the folder your volumes still exists, but you’ll need to reinstall the software. Cryptainermobile.exe this is the program you use to encrypt and decrypt vaults on your USB drive. 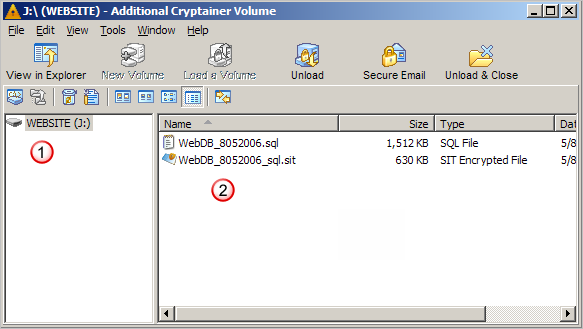 .cry files these are your volumes and contain the files and folders you’ve encrypted. You’ll notice that you can’t tell what’s contained in the vault. If someone were to find your thumb drive and open one of these volumes with the .cry extension, the data would be meaningless. 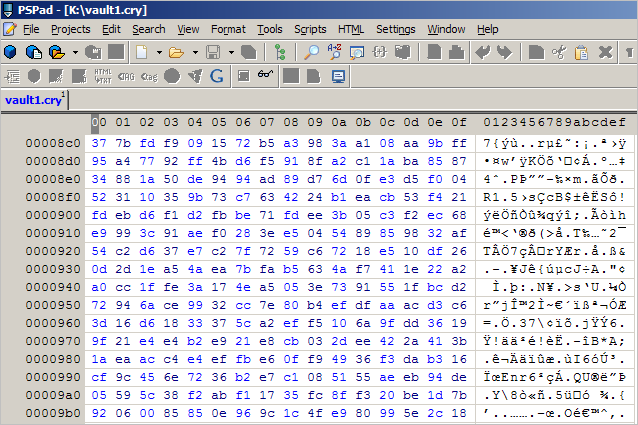 The screen shot below shows how one of my vaults looks in a program editor. I can’t figure it out and I wrote the article. 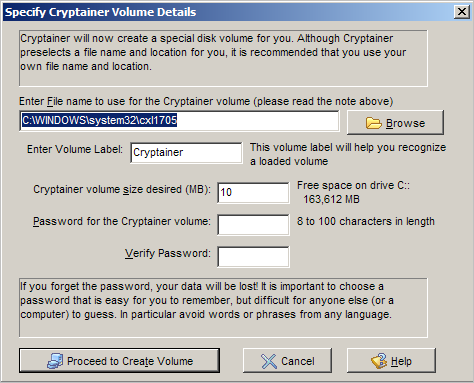 To see and use the contents of a volume, you need to load and decrypt it using the volume’s password you set with Cryptainermobile.exe. The process is fast, but varies on the size of the file. Once the volume is decrypted, you can work with it as normal. You may also view it as a drive using Windows Explorer. In the example below, I’ve loaded my vault1.cry as Drive: J. At this stage, you can also see the assigned volume name (1) WEBSITE, which is more meaningful than vault1.cry. On the right side are the two files. I can now work with these files as normal until I unload the volume. For example, to add more files to the volume, I can drag and drop them from my desktop into the volume. To get the mobile version on your thumb driver, you need to first install the Cryptainer LE program to your computer. Even though I’m highlighting the Cryptainer Mobile, it is part of the bigger program. The benefit is that you can use the same protection on your computer folders and files. One item that people may skip during the installation process is the program’s end-user license agreement. You would be wise to give it a look as it has clear language that states you’re out of luck if you lose your password. The company can’t retrieve your data and it will stay encrypted until you remember it. Use caution when setting your password(s) as you want one that protects your data, but not one people could easily guess. During the computer installation, you’ll be asked to create a volume. This is where you define the size and give a meaningful name. The first volume you create becomes the primary volume which means it displays by default after you enter your password. The dialog will set certain values set such as file location and size, but you can easily change these. The maximum volume size is 25 MB. This is a limitation of the free version, but you can create multiple volumes on a drive. It’s important to note that this space is allocated immediately and not based on when you add files. If you don’t plan on using the desktop version, you might want to create a smaller volume. After retyping your password, click Proceed to Create Volume. The mobile program files will be copied to your USB drive. To start the mobile version, you need to close the desktop version. The process for creating volumes on the USB drive is the same as on the desktop. The hardest part in this whole process is deciding on the correct password to use. Although the mobile installation is a two-step process, it won’t take long. From there, it’s a simple matter of opening the program and dropping whatever files you wish to protect in your vault. As long as you have the volume loaded, you can use your data in a normal fashion. Once you pull the thumb drive out, the volume unloads and the files can’t be opened or viewed without the password. One item to remember is if you use the desktop version and drag and drop files, you’re copying files to the new volume. In other words, if I create a volume on my desktop which is assigned Drive E: and I drop a folder from My Documents into that vault, I have two copies on my computer. One is the original in My Documents and the other is the copy I placed in the vault. Initially, I thought the 25MB size volume restriction would be an issue for me. Instead, I’ve found I prefer having multiple volumes based on the nature of the data. You also have the option of upgrading the program for a small fee which removes this restriction and adds more standardized methods of encryption. on a removable USB drive. This program will put your mind at ease and protect your data in the event the drive is lost or stolen.